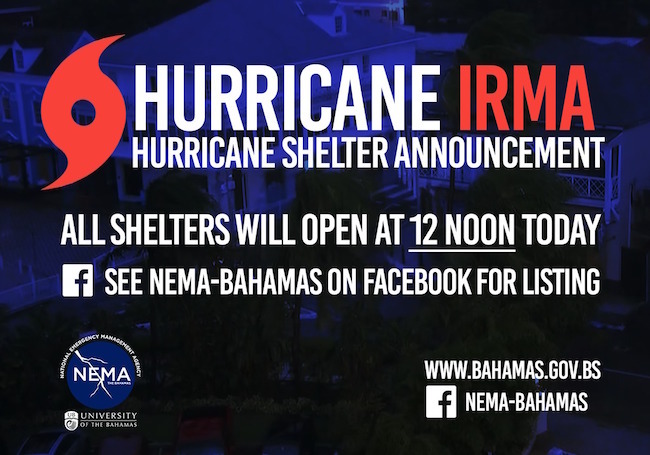 NASSAU, The Bahamas – All remaining emergency shelters are to open at 12 noon today, to accommodate residents who might have to evacuate their homes due to severe flooding expected from the dangerous Hurricane Irma. The shelters in the Southern Bahamas were activated on Thursday, for residents who decided to remain on those islands and braced for the arrival of Hurricane Irma. Those include Mayaguana, Inagua, Crooked Island, Acklins, Ragged Island, Long Cay, and Samana Cay. As The Category 4 storm makes its way through The Bahamas, the remaining shelters would open to accommodate residents seeking refuge from excessive flooding in their areas. Captain Stephen Russell, Director of NEMA noted that The Bahamas experienced major hurricanes, which produced excessive flooding. Hence, residents should take advantage of shelters or other accommodations at higher levels. Storm surge of 15-20 feet and rainfall 8 – 10 inches are expected to produce severe flooding in low-lying areas. Residents living near coastal communities are being advised that if their homes are in flood-prone areas, to seek the nearest hurricane shelter or seek higher grounds. The latest Alert from The Bahamas Department of Meteorology forecasts the path of Hurricane Irma: LATEST ALERT HERE.